Building on the Fixed and Growth Mindsets, the Benefit Mindset is presented as a necessary evolution of how we connect the dots between individual wellbeing and collective betterment. Update June 2016: visit benefitmindset.com for our latest articles and references. I’ve just completed a Master of Applied Positive Psychology at the University of Melbourne. What an amazing experience; it was truly transformational. Coming in as a sustainability and social impact consultant, I had no idea of what to expect. The course opened my eyes to the world of psychological wellbeing, and what it means to be thriving on an individual and collective scale. For those of you who are new to Positive Psychology, its premise is that the absence of psychological issues is not the same as the presence of psychological wellbeing and resilience. It seeks to explore what’s right with people, to gain a more scientifically rigorous and complete picture of human nature, and to understand what constitutes the optimal functioning of individuals, groups and institutions. We studied the reasons behind why some individuals and groups perform well above the average in various psychological and cognitive abilities. This includes the qualities that empower people to operate at the peak of their potential: to live longer and healthier lives, to participate in more satisfying relationships and to have an abundance of engagement and purpose in their lives. I focused my studies on the importance of mindset (the deeply-held stories we tell ourselves about the nature of reality) in shaping a better future. In particular, I studied how thriving and ‘being well’ on an individual level can support thriving and ‘doing good’ at the scale of whole systems. Or more simply, how people can be of value to, and benefit from, the bigger systems they belong to. Keeping a long story short, this research led me to a big realisation: If we want a more sustainable and socially just world, our mindsets matter – a lot! And while there is a growing community of amazing people who hold this purposeful, ‘being well’ and ‘doing good’ mindset, in psychology there is unfortunately no name for it. This is a problem, because it means that it doesn’t get discussed, studied or encouraged anywhere near as much as it probably should do. I think it is time to change this situation. 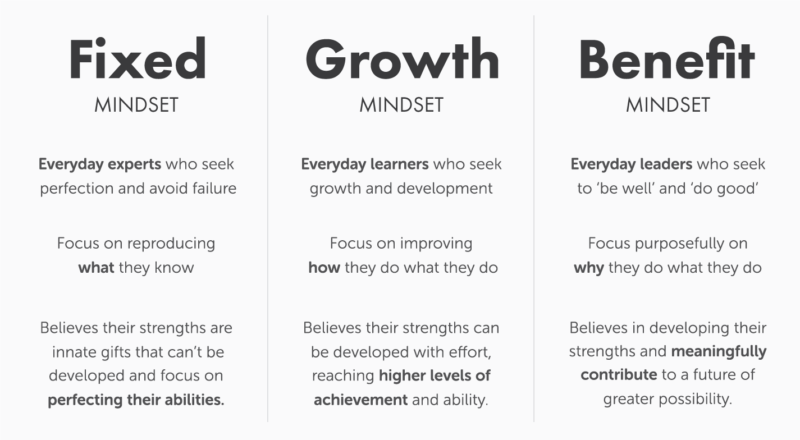 Today’s two best-known and studied mindset paradigms are Carol Dweck’s Fixed and Growth Mindsets (see table below). It’s coming up to 10 years since these mindset paradigms hit the mainstream with the release of Dweck’s bestselling book, Mindset: The New Psychology of Success. While her work has been instrumental in explaining how we can achieve our potential, its orientation, as the title suggests, is towards individual success and accomplishment, rather than what’s good for us collectively. There is an argument to say that, by giving the ‘psychology of success’ a name, it has encouraged a great many people to pursue ‘accomplishment for accomplishments sake’, more so than thinking about how they can contribute to the collective good. Personally, I think we can do better. 10 years on, and people’s aspirations are changing. It appears a new narrative is beginning to rise. It’s a narrative that looks beyond success, and is based on what it takes to be of value. From the Benefit Corporation movement, to the Living Future philosophies, and the Sharing Economy, there is an emerging trend for communities and organisations to make valuable contributions to causes that are greater than the self, and to be a resilient force for good. My Masters suggests that it’s time to define this value-based mindset, and to put it on the radar of more people. I called it the Benefit Mindset: a way to describe and encourage the qualities of mind that some people use to promote thriving and wellbeing on both an individual and a collective level. The mindset of a person who is able to discover their gifts and strengths, and is empowered to use them to create a meaningful future of greater possibility. Want to find out more? Visit benefitmindset.com for our latest articles and references. Unless people hold genuine concern for the interconnected systems they are a part of, and develop the abilities to attend to, and interact, with those systems, many ‘doing good’ initiatives are likely to be unsuccessful. Imagine what would be possible by combining the Benefit Mindset with say, the Benefit Corporation movement, using the power of business to solve environmental and social problems. Imagine how people with this mindset would positively impact the performance of a green building, or a social enterprise. Or what about the ripples of change that would be possible, if our children became exemplars of this mindset. There is an argument to say this is old wine in a new bottle. It’s something that our change-making parents, teachers and purpose-led businesses already know. But what has been lacking is a simple, sharable description of the mindset our change makers use to create a brighter future. It’s hoped that this new Benefit Mindset paradigm can further our shared exploration and understanding of the importance of mindset in building a better world. Please share, and get in touch if you have comments. Ash Buchanan (@CohereSustain) is a Director at Cohere. He is a recent graduate of the Master of Applied Positive Psychology at the University of Melbourne and a past fellow of the Centre for Sustainability Leadership in Australia. This is licensed under a Creative Commons Attribution-NonCommercial-NoDerivatives 4.0 International License.